The motorsport season is upon us. 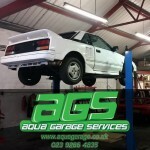 Aqua Garage Services provide mechanical support services for independent race drivers, drifters, hill-climb car drivers, classic racing & general competition vehicles. From engine work, to suspension, fabrication & roll-cages, AGS will assist you into the season. Double win for AGS Nissan 200SX! The well prepared, AGS backed – Nissan 200SX achieves success in the first two races of the opening round of racing.